West Ham defender Pablo Zabaleta is only one game away from triggering the contract extension clause in his contract and could see it activated this weekend against Leicester City, according to Football.London. The football news outlet claim that the Argentine is now on the brink of extending his stay at the London Stadium for another season with the significant clause, having made 24 Premier League appearances, his latest coming in the starting XI against Manchester United. 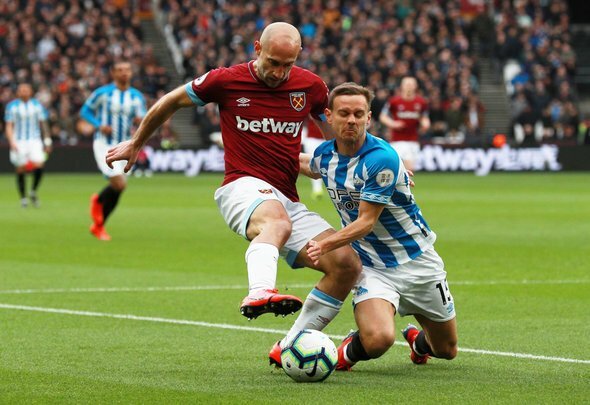 It is stated that Zabaleta is in line to start once again when they play host to the Foxes on Saturday, with Ryan Fredericks set to remain on the bench after conceding a penalty following his introduction as a substitute versus the Red Devils. Fredericks might have been in contention for the club’s clash against Leicester had he put in an impressive display against Manchester United, with Manuel Pellegrini having shown a tendency to rotate between the two full backs this season. Instead he put in a disappointing performance which only strengthens his counterpart’s grip on the role in the starting XI. As for Zabaleta, he might not have expected to start so much this season when Fredericks arrived from Fulham but instead he has been a regular for his manager, hence why he is on the brink of triggering a contract extension. It remains to be seen whether he does actually want to stay at the club over the summer, with Pellegrini likely to look for a long-term replacement for the veteran, but it seems almost certain that the clause will be triggered – if not this weekend then at some point before the season is out.